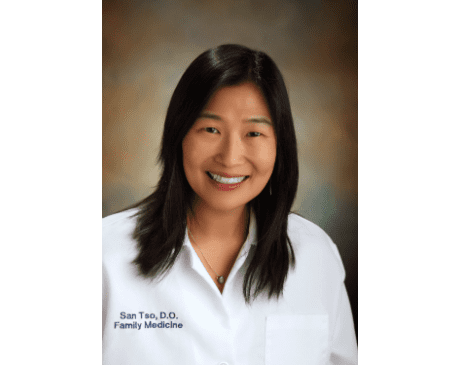 San Tso, DO is a board-certified family medicine doctor with 20 years of experience. At HT Family Physicians, a top-rated family medicine practice with two locations in the cities of Stockton and Lodi, California, Dr. Tso provides a full scope of primary care services to patients from the greater San Joaquin area. Born in New York, Dr. Tso grew up in Fremont, California. She received her undergraduate degree from San Jose State University, in San Jose, California. After a short stint working as a biologist at a biotech company in Silicon Valley, she enrolled in medical school at Western University of Health Sciences, College of Osteopathic Medicine of the Pacific, in Pomona, California; she received her medical degree in 1997. Dr. Tso went on to complete her internship and family medicine residency training in Stockton, California as part of the University of California Davis family practice residency program at San Joaquin General Hospital, where she served as chief resident. After practicing as a family physician in Eureka, California for several years, Dr. Tso joined HT Family Physicians in 2004. She’s affiliated with Dameron Hospital and St. Joseph’s Medical Center of Stockton. Dr. Tso loves spending time, especially outdoors, with her husband and two children. She’s fluent in Mandarin and enjoys running, working out on the Stairmaster, and all things Hollywood.